The Cartagena Summit concluded on 4 December with the high level representatives of approximately 100 States Parties signing the Cartagena Declaration, reaffirming their commitment to ending the suffering and casualties caused by anti-personnel mines and to achieving a world free of mines. The Cartagena Summit on a Mine-Free World was the name given to the Second Review Conference of the Convention on the Prohibition of the Use, Stockpiling, Production and Transfer of Antipersonnel Mines and on Their Destruction. The Convention seeks to end the suffering caused by antipersonnel mines – by prohibiting their use, requiring the destruction of existing stockpiles, and obliging States to clear mined areas and assist victims. This landmark international legal instrument, which has been accepted by 156 States, entered into force on 1 March 1999. Article 12 of the Convention states that a Review Conference shall be convened by the Secretary-General of the United Nations five years after the entry into force of the Convention. The purpose of the Review Conference is to: review the operation and status of the Convention; consider the need for and the interval between further Meetings of the States Parties; take decisions on submissions of States Parties as provided for in Article 5; and, adopt, if necessary, conclusions related to the implementation of the Convention. Communicate the impressive progress that was made towards a mine free world in the first decade of the Convention and focus on the remaining challenges for the States Parties and their partners towards the full implementation and compliance of the Convention. Focus the world’s attention on the humanitarian essence of the Convention: the rights of people and our commitment to survivors and to mine-affected communities. In doing so, we can recommit our support to a life in dignity for all who every day live with the consequences of landmines. Remember that anti-personnel mines is a living problem with socio-economic consequences which cause great suffering and pain to people in several countries. Make sure that the civilian population affected by landmines are heard and involved, including by applying a gender perspective to mine action. Reinvigorate national implementation and compliance efforts and enhance national ownership among States Parties to fulfill their obligations on international cooperation and assistance, clearance, stockpile destruction and victim assistance. Promote the international norm created by the Convention that use of anti-personnel mines is prohibited and unacceptable, continue the universalisation efforts and encourage further international cooperation towards strengthening human security. 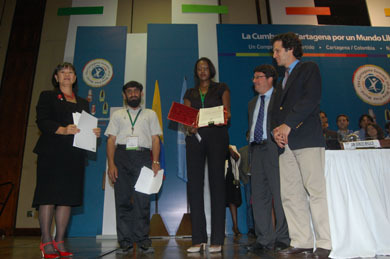 The Cartagena Summit was held at the highest possible level. High level commitments were made to pursue the aims of the Convention during the next five years.